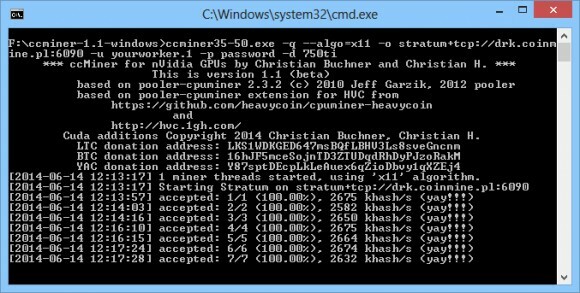 The source code of the ccMiner GPU miner for Nvidia has been updated to version 1.1 with a “Killer Groestl” implementation that essentially improves the hashrate for Groestl and other algorithms that use it. So with the new version you should see improvement in terms of speed for mining quark, anime, x11, jackpot, groestl, myr-gr and nist5 coins with ccMiner. There is no official binary release available, but we have compiled one to test it and you can download it below. Do note that this official update does not yet include X13 support, there is an unofficial fork with X13 support available, but the next update should also include the code for X13. So with it there should also be some speed improvements with X13 mining as well, so keep tuned for more updates very soon from the author of the software. Trying out the new ccMiner 1.1 on a GeForce GTX 750 Ti GPU has shown some really nice improvements in terms of hashrate from the previous release without the Killer Groestl implementation. We are now getting up to about 2700 KHS on X11 versus about 2200 previously, Groestl gets us close to 7600 up from 3300, for Jackpot from about 3900 to 5500 and Talkcoin (NIST5) from 4800 to 8200. So the speed improvements are really worth the wait and if you are mining a coin using Groestl with your Nvidia GPUs at the moment you should definitely update your ccMiner. Do note that the windows binary you can download below is compiled for Compute 3.0 and Compute 3.5-5.0 cards (32-bit version only), so it will not work on older cards. If you are unsure what version of Compute does your video card support check the included GPU Compute Capabilities List file. It is also compiled with Visual Studio 2012, so if you do not already have Visual C++ Redistributable for Visual Studio 2012 you will have to download and install it, otherwise you may be getting error for a missing DLL library.